There are certain circumstances in life that throws you off the track and gets you wondering what the next step should be; like when you are dealing with an unexpected death in the family, an industrial accident, or there is an abandoned property that needs a thorough cleaning. This is where Bio Clean Inc. steps in with our excellent disaster response team. Irrespective of what has happened and where it has happened our staff will respond immediately. Our efficient workers will remove any signs of contamination, and quickly restore the place so as to prevent the spreading of trauma. The BCI staff is certified, and has all the necessary protective gear required to safely clean any trauma scene. We know the overwhelming burden you feel after the unfortunate incident happens, so, our team tries their level best to ease out this burden. We have been serving the families of Bellingham, Everett, Olympia WA, Redmond, Renton, and Seattle for the past 20 years. Below we have mentioned 3 reasons why you should call us at your times of need. Do take a look. We know that most of our work revolves around a sensitive atmosphere. The BCI staff will never share any of your information with anyone as we respect your privacy. Cleaning up your property after an unfortunate incident can be a bit tricky when it comes to the insurance coverage. We negotiate directly with your insurance agency on the degree of coverage provided by them, thus releasing you of that headache. Before diving into the cleanup process, our workers will give you a rough estimate of the cost, so that you can be prepared beforehand. Though we discuss the cost and your ability to pay for the service we never harass you for immediate payment as we are well aware of your emotional condition. So, if you are facing a difficult situation, you can call us at (888) 412-6300 and let us help you. With the increasing rate of crimes around us, it has become pivotal to keep ourselves safe. Even if the crime has not occurred directly to you, any criminal situation happening around you is also quite dangerous. That is why you need crime scene cleaners. We, at Bio Clean Inc., can help. We can effectively restore your damaged property, remove any source of contamination from the bodily fluids or biological residue or toxic chemicals, dispose of the medical waste, deodorize, and sanitize so as to erase any sign of the crime happening. We have knowledge and experience in the right technique and equipment so we can give you a highly professional yet discreet service. So, if you are from areas like Bellingham, Everett, Olympia WA, Renton, Seattle, or Tacoma, you can rely on us. Here, we have put together a list of important things that we can help you with. Take a look. If tear gas has been used in the crime scene, we can help. Tear gas is dangerous because it affects the open wounds, eyes, skin, and your airways leading to irritation, burning, difficulty in swallowing and chest clogging, nausea or wheezing and so on. Long-term impacts include asthma, cataract, glaucoma, scarring, etc. We are trained and certified to properly clean the area and make it free from any remaining residue of the tear gas. Sometimes, a vehicle is also exposed to blood, vomit, urine, feces, or other kinds of biological residue which contains some lethal pathogens. So, the vehicle decontamination is of utmost importance. We can do a comprehensive cleaning and decontamination of the vehicles with enzyme detergents and sanitizers to dispose of and remove the hazardous materials. We also take out seats and dismantle parts which are contaminated. So, if you are looking for a company that can help you with such crucial aspects of cleaning, then reach out to us now. There are several kinds of disasters that one is likely to experience in their lifetime. Right from natural calamities to unnatural deaths due to accidents or criminal activities, there are so many tragic sites that one witnesses. These situations are not just life threatening but quite traumatic. You are left with a constant feeling of grief, shock, and vulnerability which can even lead to serious mental health concerns. Moreover, these sites are full of blood, bodily fluids, and other germs and bacteria which can spread dangerous diseases and infections. That is why you need a good disaster response or management team to rescue you as well as clean and disinfect the area as early as possible. We, at Bio Clean Inc., can be the emergency clean up service and disaster management team you are looking for. We are one of the most experienced and reputed companies with highly qualified individuals working for us so as to keep the environment around you cleaner, safer, and healthier. So, if you are from areas like Bellingham, Everett, Olympia WA, Redmond, Renton, or Seattle, you can rely on us. Here, we have put together a few factors that are absolutely necessary for any disaster mitigation service. Take a look. First of all, the company you are hiring must have knowledgeable and well-trained team members who have the right awareness of the different kinds of bacteria and germs found in an accident site. If they don’t have the knowledge, then they will not be clean the area and make it safe for you. An emergency can occur at any time. You never know what kind of crime can take place near you at what time. So, if you can reach out to the disaster response team at any time of the day, it is obviously helpful. Therefore, such a service should also extend a 24×7 service. And if you think, we can be the right choice for you, then call us at (888) 412-6300 now. Bio Clean provides bio-hazard disaster response throughout Bellingham, Everett, Renton, Seattle, Tacoma and Washington. 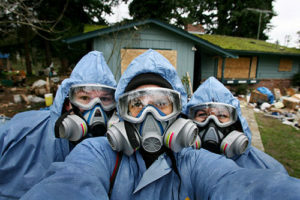 They are a biohazard remediation company and can help with cleaning and remediation of crime scenes, suicide scenes, unattended death, accident scenes, hoarding houses, meth labs, drug houses and more. When the unthinkable happens you will be left traumatised and confused. It may be difficult to know what to do next. A disaster response company such as Bio Clean can and will help. They can’t undo the unfortunate events, but they help deal with the next steps including cleaning and remediation. A crime scene or accident scene can be horrific and very traumatic. The last thing you want to worry about is cleaning, remediation and restoration. Fortunately there are disaster response teams that are trained to deal with these circumstances. If your home or property becomes the scene of a violent act, unattended death, suicide or serious accident you will need help. The disaster response team at Bio Clean understand that these unforeseen and unthinkable events are never planned and can happy anywhere anytime. They are there to help you whenever you need them, day or night. A disaster response team will perform the required cleaning, sanitising, disinfecting and restoration. They know how to deal with blood spills and spatter, fingerprint chemicals, bodily fluid remediation, odor remediation and more. Disaster response can often be that extra hand when you just can’t cope. They will get your property restored to pre-incident condition, so you can slowly get your life back together. Whether you have a tragedy at home or work, Bio Clean disaster response is there to help pick up the pieces and get things back on track. 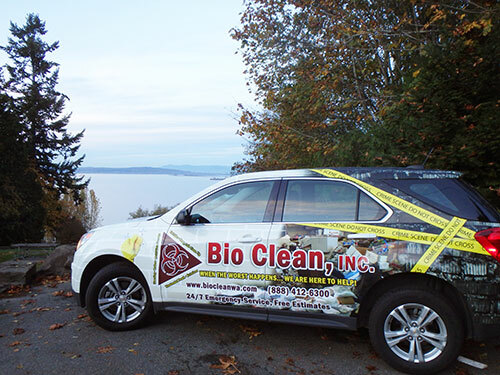 Bio Clean is your source for bio hazard response in Bellingham, Everett, Renton, Seattle, Tacoma or Washington.